Green Can and Yard Trimmings are collected every week. 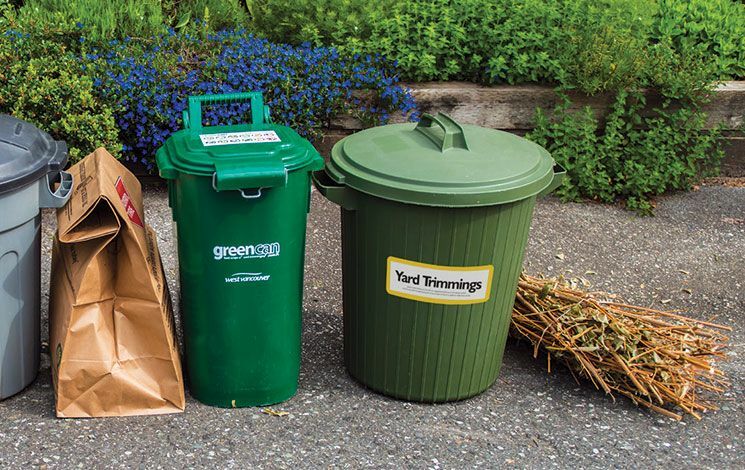 Organics, which includes food scraps and yard trimmings, are banned from being disposed of as garbage and should be placed in your Green Can, yard trimmings container or backyard compost. Green Can: Place food scraps and food-soiled paper in a 46-litre container (e.g. Orbis NPL 280A) clearly labelled as a Green Can. Yard Trimmings: Place grass clippings, leaves, small trimmings, plants and flowers in a lidded 77-litre can with a Yard Trimmings decal. Kraft Paper bags with folded tops are also accepted. Bundle twigs and branches with bio-degradable string or twine. No wire, nylon or plastic strapping allowed. Place bundles beside, not inside, cans. All materials must be set out between 5 a.m. and 7:30 a.m. on the day of collection. small amounts of yard trimmings. Irresponsibly managed waste is the cause of 80 per cent of interactions between humans and bears on the North Shore and could be prevented. Backyard composting is the most cost-effective and environmentally friendly way to recycle food scraps and yard trimmings. If you’re composting at home, thank you and please carry on! You are diverting waste from the landfill and getting a rich fertilizer for your garden. Three ways to get decals, boxes and bags you need! Have them delivered to your door by contacting Smithrite directly at 604-929-3416. The online form is temporarily down due to a technical issue. Please check back soon. Note: Green Cans and Garbage Cans can be purchased at a local retailer. Please consult the collection guide or website for size requirements. Here’s a simple and effective way to trap fruit flies in your home.